Gifted physician, essayist, poet and lecturer, Oliver Wendell Holmes, Sr. (August 29, 1809-October 7, 1894), was one of 19th Century America’s literary and medical giants—as well as father of the eponymous Supreme Court Justice. In celebration of his long life, many accomplishments and the 200th anniversary of his birth, the NLM has opened a small exhibit, Physician at the Breakfast Table: Oliver Wendell Holmes as Popular Icon. Among other things, the exhibit highlights The Autocrat of the Breakfast Table, a collection of immensely popular essays, first published in 1858, that made Holmes Sr. a household name and much sought after lecturer. Professor of anatomy at Harvard for more than 30 years, he is best remembered medically for his 1843 work on the contagiousness of puerperal fever, which challenged establishment views about treatment of women during childbirth. Included in the exhibit are 22 items, including the 1886 color lithograph by Leslie Ward, from Vanity Fair (pictured), and nine colorful editions of The Autocrat, from the collections of The National Library of Medicine and Marilyn Barth of Washington, DC. The exhibition runs until January 11, 2010 in the History of Medicine Division Reading Room. 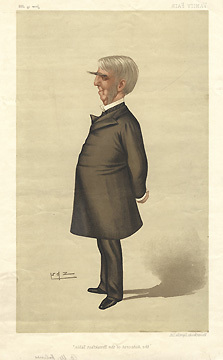 Caption: Caricature of Oliver Wendell Holmes, Sr., by Sir Leslie Ward, from Vanity Fair, June 19, 1886. August 1, 2009 in Collections, Exhibitions.